I’ve setup a new SQL Server 2016 AG Environment for Developers where they will use it for deploying and testing code, which means that they also want to SQL Server Integration Services for deploying and executing SSIS Packages. From SQL Server 2012 and onwards we have the new deployment model for SSIS and also the addition of SSISDB. One of the features highly requested was the ability to add SSISDB to AG, which was also added, but before SQL Server 2016 the failover of the SSISDB database has to be done manually, on which you end up having more work to do. In SQL Server 2016 it was added the possibility for automatic failover of SSISDB. First thing you need to do is in the primary replica to create the SSISDB. After you created the database in the primary replica, add it to the AG. Here is something tricky you need to do. In your setup the option to select SSISDB is blocked, because firstly you need to specify the same password that you used to create the SSISDB, because this key will be used to create the SSISDB in the secondaries later. After you fill up the password, you will need to click on REFRESH button in the bottom screen. Seriously, you need to do it! Then, after the first refresh (let’s say that) , what you see is. However you still cannot select the database, because for the second time you need to click in the REFRESH button. After that’s done you will be able to select and proceed with the setup. Now, this is very important. Do not select the neither “Full” nor “Join only” synchronization methods. All the initial pre-checks are skipped and the last validation mentions the necessity of later the Enable AlwaysOn support to be done for SSISDB. Follow the steps to end and you will get something like that. Connect to the secondary replicas and click ok. Done! The SSISDB is now in the AG. Something you should pay attention is the process to roll out uprades or patches to SQL Server when there is a SSISDB in the AG, which the whole explanation you will find it in this document below. Posted on April 28, 2017, in Availability Groups, Dicas, Integration Services, SQL Server 2016, VirtualPass and tagged Add SSISDB to AG, Add SSISDB to AlwaysOn, Integration Services, SQL Server 2016, SSISDB Always On, SSISDB AlwaysON, SSISDB with AlwaysON. Bookmark the permalink. 16 Comments. thanks you very much for sharing this information. It worked like a charm! Thanks Peter.. I need to update this post, as I have found some other interesting things that we need to do..
You say that it’s very important to select “skip initial data synchronization,” but don’t explain why. Could you explain why this matters? 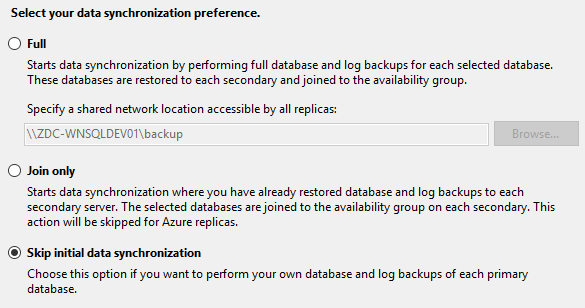 When you use that option, means that you, outside that wizard will perform by yourself the backup/restore operations for the database. Because SSISDB is somehow a system database, the process of including it in the AG is a bit different than for a normal user database. I, too, was troubled that you did not explain why it was important to skip the initial data synchronization. We went ahead & used auto seeding & it seemed to work fine. When I failover my instance, my new primary server complains about the master key. Could you help me? How the correct way to restore de ssisdb database? This is the part of my article that still needs to be updated. However, the idea is this one described below by Matt Masson. I am doing what he is describing in this article and failovers are working properly. I think that the great deal with sql server 2016 ssis was the always on support, I thought that trick was not necessary anymore. The Matt article talh about ssis on a sql server 2012. Hi Marco, Thanks for the article. I have a few questions on this task. 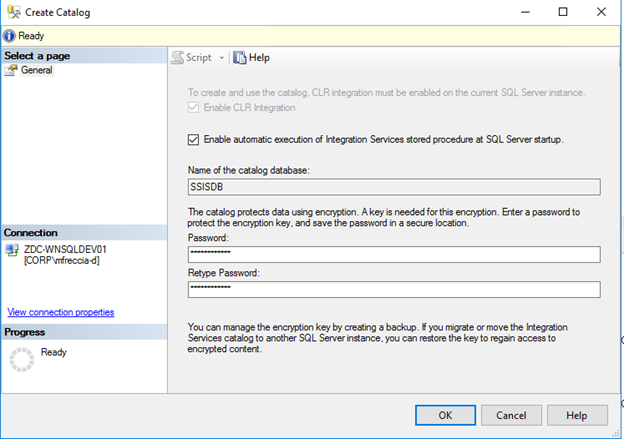 Do I need to Install SSIS on secondary server before creating catalog on primary server? 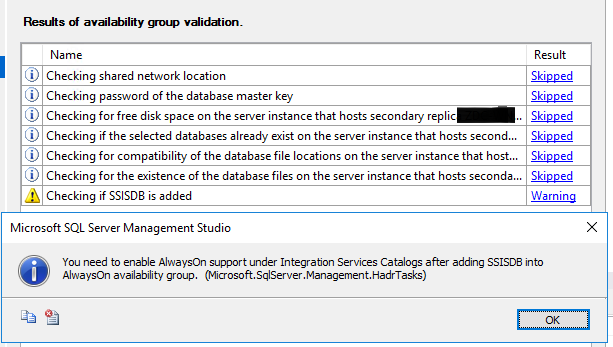 And Could please verify my steps here… I have AlwaysOn AG set up now I am installing SSIS . Is anything else I should do? Thanks for commenting here and for your question. For your first question the answer is yes, you need to install the SSIS Services on both servers (Primary & Secondary). So, your step by step would work and it is correct. Thanks for your blog, so appreciative of people sharing their knowledge! I followed all your steps but sadly it is not working for me. I go through all the steps and I can add SSISDB to the availability group, it says it’s in a syncrhonized state on the primary replica. But when i look at my secondary replica, SSISDB is not there??? I then check the AlwaysOn Dashboard on the primary and it has Warnings – if i expand into the AG, it says that SSISDB is not joined?? What have I missed? How does SSISDB get created on the other side? You say you need to choose the ‘skip synchronization’ step but how does SSISDB get created on the replica? Do we not have to do it manually?